English is the primary language of the School. We customize and optimize Mandarin classes for each student, allowing them to efficiently achieve their desired proficiency in the Mandarin language at their own pace. We follow the HSK syllabus. Our minimum goal for all students is to complete and pass the HSK 4. 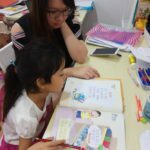 It is important for children to obtain equal exposure to both English and Mandarin, it helps to increase a child’s confidence in speaking and communicating in Mandarin. At 5 Steps Academy, we believe in the importance of attracting and maintaining a child’s interest in the language. We use creative methods of teaching such as singing, drawing and skit performance to build the child’s speech, listening and writing skills. We created the program for non-native English speaking students who wish to achieve fluency in the language. This program is available to students of any nationality and is critically important in their further studies, and beyond. As always at 5 Steps Academy, students can learn according to their abilities and at their own pace. We also have Spanish, French, Russian, Hindy, and Tamil.